Here are just a few of the people who have done and who are doing amazing gardening or environmental projects for Earth Day and everyday. There is a man in Baltimore who wants to create a tranquil city. For almost three decades, Gene DeSantis has made it his mission to plant trees throughout Baltimore — with nearly 14 thousand of them planted so far. You can read about Gene DeSantis here. He reminds people of that famed American naturalist before him, Johnny Appleseed, who spread apple seeds throughout the United States. If you do not know about Johnny Appleseed and his kind and generous ways, his great leadership in conservation and the symbolic importance he attributed to apples, read about him here. Another incredible man who created a forest is Jadav “Molai” Payeng. Thirty years ago Jaday Payeng ” began burying seeds along a barren sandbar near his birthplace in northern India’s Assam region to grow a refuge for wildlife. Not long after, he decided to dedicate his life to this endeavor, so he moved to the site where he could work full-time creating a lush new forest ecosystem. Incredibly, the spot today hosts a sprawling 1,360 acre of jungle that Payeng planted single-handedly. ” To read his story read the article in the Times of India. 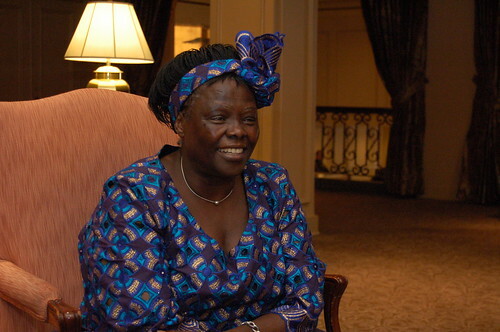 Then there was Wangari Maathai, ‘Africa’s “tree woman'” who founded the green belt movement in Kenya in 1977 and was awarded the Nobel peace prize in 2004. The movement has since planted more than 10 million trees to prevent soil erosion and provide firewood for cooking fires. Sadly she passed away in 2011, but she has influenced many people around the world to help the environment including a garden park that is being designed, created, and sustained by the community for the non-profit benefit of the Washington DC community. This Garden is named Wangari Gardens in her honor. Here is The Guardian’s, the British Newspaper’s, list of the top 100 Earthshakers of all times. It is amazing what just one individual can do. Imagine a world full of wonderful Earth caretakers.